Hunger Games: Who’s Right About Food Stamps? Beyond the anecdotes about lazy surfers and hungry kids, where do the savings really come from? Thursday, the House passed a bill to spend $39 billion less on Food Stamps (than current law would spend) over the next ten years. All Democrats and 15 Republicans voted against it, but it passed 217-210. President Obama has pledged to veto it, but before it reaches his desk it still has to be reconciled with the Senate farm bill, which cuts Food Stamps by $4 billion. Image vs. fact. The public debate around Food Stamp cuts has consisted almost entirely of imagery. Fox News’ hour-long special “The Great Food Stamps Binge” anointed lobster-buying surfer-musician Jason Greenslate “the new face of Food Stamps”, while MSNBC focused on kids and military families. Ezra Klein interviewed author and ex-sergeant Kayla Williams about growing up on Food Stamps, and quoted a blog post by an unemployed Afghanistan veteran currently receiving Food Stamps. Each image is moving in its own way, but how well do any of them represent reality? First, let’s establish some facts: We’re talking about the Supplemental Nutrition Assistance Program (SNAP), which cost the government $74.6 billion in FY 2012. As of last September, 47.7 million Americans — about 1 in 7 — were receiving SNAP benefits that averaged $134 a month. To be eligible for SNAP, your income must be lower than 130% of the poverty level, or about $30,000 for a family of four. As you can see from the chart, the percentage of the population getting SNAP benefits fluctuated with the business cycle until Clinton’s welfare reform in 1996, then started increasing again when the 2002 Farm Bill loosened up eligibility. (The anomaly in the chart is the increase during the “Bush Boom” of 2002-2006.) It really took off when the Great Recession hit in 2008. Recently, the number of households receiving SNAP has roughly matched the USDA estimate of the number of households that are “food insecure”. Both numbers jumped between 2007 and 2009, and both are currently about 1 in 7. Lost in most of the discussion is the question of where the estimated $39 billion savings comes from. Anecdotes or even averages about SNAP recipients are meaningless in this discussion unless they apply specifically to the people who will lose their benefits. The detailed CBO estimates show that most of the provisions of the House bill have little impact on cost. (It didn’t even bother to figure the savings from Section 110, “Ending supplemental nutrition assistance program benefits for lottery or gambling winners.”) The entire $39 billion comes from three changes. Work requirements. The biggest chunk, $19 billion, come from Section 109, “Repeal of state work program waiver authority.” That also accounts for the most immediate impact: $3.3 billion in FY 2015. This sounds like the waivers in welfare work requirements that Mitt Romney so brazenly misrepresented in 2012, but it’s actually different. The SNAP rules say that able-bodied adults without children are limited to receiving 3 months of SNAP benefits every 3 years, unless they are spending at least 20 hours a week either working or participating in a job training program. The 1996 law that established that requirement allowed governors to apply for waivers if their states had high unemployment, figuring that it’s not fair to require hungry people to work if there are no jobs. That’s what’s being repealed. That change shouldn’t affect any children, but it should cut off both Fox’s freeloading surfer and MSNBC’s unemployed Afghanistan veteran. (I didn’t find national estimates, but adults without children who don’t work 20 hours a week are about 8% of SNAP recipients in Texas, according to the Dallas Morning News. ) How you feel about it largely depends on which one you think is more typical. I suspect the vet is more typical, but I don’t really know. How you feel also depends on your mercy/severity bias. Some people would gladly feed ten freeloaders to save one person from going hungry through no fault of his or her own. Others feel justified in cutting off ten hungry innocents to force one Jason Greenslate back into the job market. Categorical eligibility. The second biggest savings, $11.6 billion ($1.3 billion in 2015), comes from Section 105, “Updating Program Eligibility”, which eliminates something known as “categorical eligibility”. CE amounts to the idea that if you’ve already qualified for one needs-based government program, you can qualify automatically for some others, even if the eligibility requirements don’t match perfectly. This saves overhead costs for the government and shortens the lag time of waiting for your paperwork to go through, at the cost of giving benefits to people who might make a little more than 130% of the poverty level. So that’s the whole $39 billion right there. Everything else in the bill is window dressing. For example, drug-testing recipients — which the House bill does not mandate but allows states to do — will almost certainly cost the government more for the tests than it can save by denying benefits to drug users. That was already true when Florida tried it for welfare applicants, and since SNAP benefits-per-person are much less, the loss should be even bigger. Dependence. The Republican rhetoric on this issue revolves around the word dependence: dependence on government, creating dependence, and so on. The implicit assumption is that people who are getting aid would otherwise take matters in hand somehow. (And that we would approve of how they did it. After all, isn’t Breaking Bad the story of a man realizing that no one is going to help him and taking matters in hand?) And that in turn is based on the assumption that poverty is caused by poor people; if they’d just get out and work, they wouldn’t be poor. A third assumption is that it’s OK for children to suffer for the misbehavior of their parents; seeing their children hungry is part of what’s supposed to motivate the poor not to be poor. I see two things going on here. First, what I like to call the Musical Chairs Fallacy, which is a version of the Composition Fallacy. If a particular child is always the first one out in musical chairs, you could train him/her to be quicker and more alert. But if you trained all the kids, someone would still be the first one out, because there aren’t enough chairs. Similarly, you can imagine individual parents watching their children plead for more food and getting a burst of desperate energy that propels them into jobs they might otherwise not have found. But if all the poor get desperate at once, will that desperation create enough jobs to feed all their children? Or are a certain number of people going to go out of the game when the music stops (no matter how quick or alert everyone is) because there aren’t enough chairs? Second, there’s the problem of the working poor. 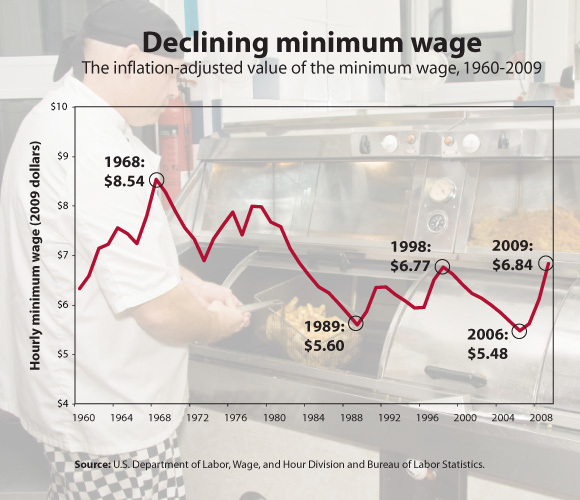 Adjusted for inflation, the minimum wage is lower than it was when I made it back in the 1970s. And our economy is creating more and more part-time and minimum-wage jobs. The increasing numbers of people on food stamps is how we’re dealing with those trends. If you’re working 30 hours a week at WalMart, you can’t feed your kids. Politicians who are against raising the minimum wage and also against Food Stamps need to spell out their plan for those kids. Summing up. The $39 billion saved by the House bill comes from three places: Cutting off benefits for unemployed adults without kids and trusting that they will find legal jobs rather than go hungry or turn to crime; stopping benefits for the working poor who make slightly too much money; and poor families being hotter in the summer and colder in the winter. What’s next? The Senate passed much smaller Food Stamp cuts (about $4 billion over ten years) back in June. That was part of a bipartisan farm bill that got 48 Democratic and 18 Republican votes. Now the House and Senate have to meet in a conference committee to work out a compromise bill, though it’s hard to imagine what that might look like. Like all the other spending bills that are hung up in this Congress, it has an October 1 deadline.